Tobacco Heart Pine flooring is comprised of brown aged heart pine boards that are salvaged form the interior of barns and tobacco drying sheds. This raw material has a deep rich brown color with the natural saw marking texture that allows for the custom sanding and manufacturing much like our popular Kendall Road product. Tobacco pine flooring offers a good average width, sound knot structure, nails holes and slight sound checking throughout the grade. From western Massachusetts down the eastern seaboard, we find select drying sheds and barns that hold these prized boards for reclamation. Bingham Tobacco Pine is manufactured from interior boarding founding drying sheds and barns. This long leaf heart pine board never saw the exposure that boards are subject to on the exterior of the building, essentially having less checks and yielding an overall wider width when being processed. 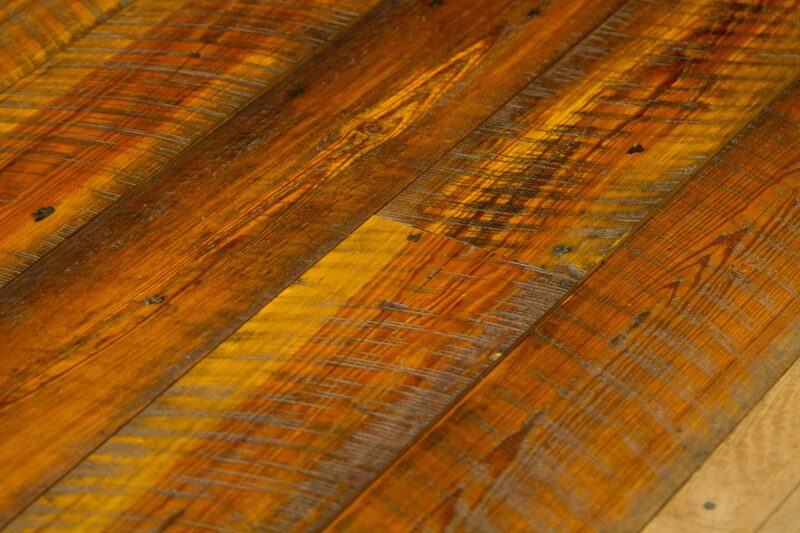 The heart pine boards, being on the inside of the structure, are aged from both time and exposure and indirect elements, creating a nice deep rich patina that when manufactured through the Bingham custom sanding process, feature a deep rich color that enhances any space.